If you follow my blog you know I have a thing for houses. They just make me happy. I like tall ones, short ones, fat and skinny ones. I didn't start this page with houses in mind. I was just playing with stenciled backgrounds. Stencils are another new love for me. I use to hate them but now they also make me want to smile. I don't even know how many stencils I used. I do know that one of them is a Crafter's Workshop stencil and that one was sequin waste. 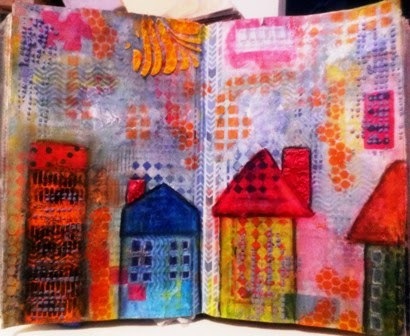 The houses were hand sketched and then colored with Lycra Watercolor crayons. I'm not having a ton of success with watercolor crayons. I sprayed these with a fixative and waited overnight and they were still not waterproof. The place that this is most evident is by the orange high rise. I tried to fix the dark color around it and finally just accepted that it was what it was. 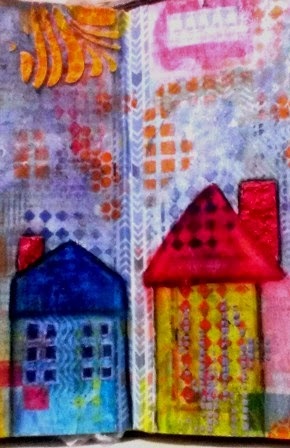 I used spacking compound for the chimneys and for other spots of texture. This is my piece for Journal 52 because this week's theme is texture. I had fun playing with this piece. I think I could have fiddled around with it for days. I had to stop myself from adding more stenciling. This is such a charming journal spread. I love your use of bold color and all the layers are fabulous, not to mention the spackled texture. And keep playing with those watercolor crayons! I love houses too Boo! I do believe this is one of my most favorite pieces that you have ever done! I love your TIME FLIES! I only wish there was a way to tie down time foe a while!! I love houses too and yours are wonderful, so fun and bright. I am a house freak I just love them so much and have no idea why. I've probably said this before but over years when it was in fashion I had house wall paper borders....nice colorful ones though... I loved them. Even today I would love them...these are fabulous in all their lovely color and whimsy! Your artwork is just wonderful--I commented already, I think, but blogger ate it! lol I adore your houses--this one especially, such a diversity of materials, so bright and appealing.